The ‘Janus Pannonius’ Museum organises an end-of-winter trip to the River Dráva linked to the anniversary of the Ramsar Convention in February (World Wetlands Day on 2nd February). Companied by an ornithologist with local knowledge, one can get an insight into the characteristics of the oxbow as wetland habitat. The General Directorate of Water Management together with the Scientific Council for the Water Sector launched a series of conferences in 2014 titled ‘Flood vulnerability in Hungary’. Having been the largest fair of the educational market, the annual International Education Fair ‘EDUCATIO’ has been organized and will be held in Budapest between 22nd – 24th January 2015. Founded in 1997, the Stockholm Junior Water Prize (SJWP) is most prestigious international junior prize within the water sector. The Hungarian national round is organized by GWP Hungary Foundation with the help and support of numerous partner organizations. The patron of the Hungarian competition is Mr. János Áder, President of the Hungarian Republic. One of the world’s longest (2,587 m) hydroelectric power stations finally operates at full capacity in Russia. The power station’s very last, ninth generator, got installed 40 years after the commencement of the investment. With the capacity of 3,000 MW utilizing the water of the Angara River, it overpowers the capacity of the nuclear power plant of Paks by fifty percent. It is the fifth largest hydroelectric facility in Russia and the white coal generated by the plant is used by the inhabitants in the region of Irkutsk and Krasnodar together with local industrial enterprises. A nearby aluminium smelter with an annual production of 600,000 tons buys a significant amount of the generated electricity. The plans of the project got prepared in the 1970s, the construction works commenced in 1974; however, the works stopped for quite some years between 1994-2007 due to lack of funds. Despite the sky-rocketing unemployment rate, hundreds of builders and labourers decided to stay in Boguchany, thus many lives got locked to the non-operating power station. The final designs of the power station were forced to be modified following a catastrophic accident at the Sayano-Shushenskaya power station in 2009. The accident claimed the life of 75 people when the water breaking into crushed the top of the station and flooded ten generators. The hydroelectric power plant of Boguchany was built jointly by RusHydro and RUSAL in a 50-50 % share via the state programme for the Integrated Development Programme of the Lower Angara Region. The first generators were put in operation in October 2012. According to Russia Today the project had been criticized by various organizations, such as the World Wildlife Fund (WWF) and Greenpeace for the re-occurring flooding caused by the dam. RusHydro manages 23 hydroelectric power plants and is currently building 7 more. The company giant has 3 geothermal power stations, 25 thermal power stations (7 new thermal plants’ construction works are in progress); furthermore, it has 1 tidal power station. The joint built-in capacity of all facilities is 36.5 gigawatts, out of which 77 % is linked to water and renewable-based energy production. The company is the world’s fourth largest white coal utilizer. Angara River is 1,779 km long and carries huge amounts of water in Siberia. In spite of its three dams, the river is only a tributary; however, Angara is the biggest power ‘producer’ in the world since it drops 400 metres in elevation and its tributaries also carry a large amount of water. Angara falls into the Yenisei near Strelka. 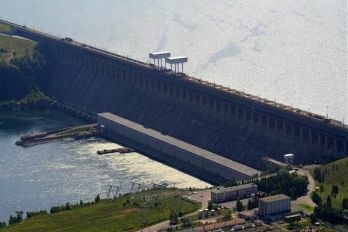 It has three dams: the Bratsk Dam, the Ust-Ilimsk Dam and the Boguchany Dam. The Bratsk Hydroelectric Power Station was opened in 1961, got completely finished in 1967 and at that time it became the world’s single biggest power producer. It has a capacity of 4,500 mega watts, the dam is 125 metres high and 3,700 metres long. The Ust-Ilimsk Hydroelectric Power Station started its industrial operation in 1980 with an installed capacity of 4,320 mega watts. In the meantime the construction of the Boguchany Power Station commenced though the construction got suspended due to the collapse of the Soviet Union. Currently the facility is in a completed phase with an imposing dam and after vast amount of earthwork. Unlike the other two power stations, the dam acts as a peninsula on the right bank of the river.